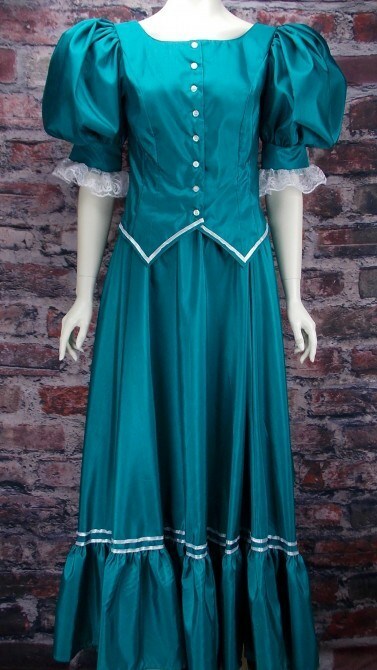 This Ensemble In Teal is Fashioned In Two Pieces with The Blouse Featuring A Full-Button Bodice Tailored To Flatter The Hourglass Shape. Puffy Sleeves And A Pointed Vest Hem Add Additional Detailing. The Long Skirt Has A 10-Inch Ruffle Along The Bottom Which Is Accented By Black Ribbon. The Skirt Is Unlined And Has A Comfortable Elastic Waist. A Slight Sweep On The Back Hem Can Be Left Down Or Bustled Up With Interior Ties. Wear With A Petticoat To Add Fullness. Length Of Skirt Is Approximately 39 Inches. Dry Clean Only.